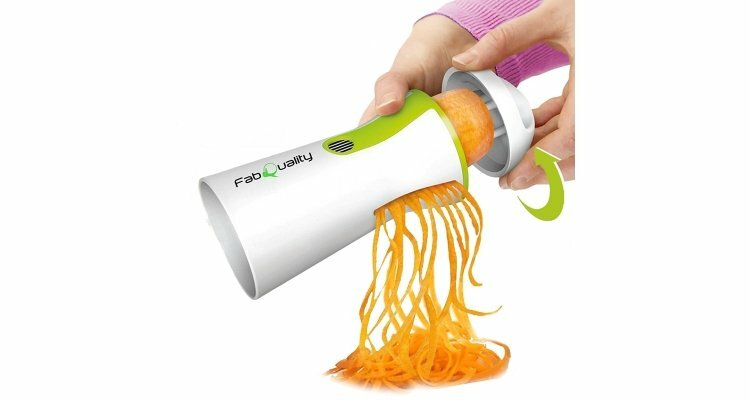 UNIQUE DESIGN SPIRALIZER Veggetti - Spiral Vegetable Slicer - Perfect for a Unique gift. No need to miss out on great tasting dishes with this low fat low carb alternative - Perfect vegetable spiralizer for Zucchini noodles - Slices through even the toughest veg. This spiral slicer ensures both BLADES ARE SAFELY CONTAINED IN THIS SEALED SPIRALIZER providing peace of mind - Encouraging children to eat veggies is now even easier with this Vegetable Spiralizer - Cooks in minutes! So you like the idea of something that looks like spaghetti but you don’t want (or particularly like) pasta. Here’s the answer. The vegetable spiralizer uses dual stainless-steel cutting blades to turn a wide variety of vegetables in to veggie-noodles in seconds. So you can take your favourite vegetables – zucchini, squash, carrots, cucumbers & potatoes and many more. It’s healthy, it’s vegetarian, and it’s vegan too! But the most important things is that you get a veggie spaghetti-like product that is very low-carb. You can diet without feeling hungry, which helps you lose weight and a low-carb diet has been shown to reduce risks associated with “bad” cholesterol (LDL), and tends to help reduce blood pressure too. The slicer works a bit like a pencil sharpener and has four different grades depending on what you’re cutting and which blade you use. Works with many, many different vegetables – even courgettes! Once you have finished it is easy to clean, (it is completely safe to use in a dishwasher if you wish), and store away as it takes up very little space in the cupboard. Included in your purchase of this vegetable spiralizer UK edition is an e-recipe book, packed with great ideas and suggestions for making the most out of this handy tool. So, an all-in-one way to eat healthily, watch the pounds, lower the carbs and still enjoy food with a fun twist … literally.